Packed with protein, omega-3 acids, and fiber, this baked flounder recipe is crispy and flavorful thanks to the addition of ground flaxseed and pecan in place of breadcrumbs. The breading makes it feel a bit indulgent, but it's actually low in fat and calories. Flounder is also environmentally sustainable and has a mild, flaky taste. The dish takes less than 30 minutes to prepare, and with only five ingredients, it makes your weekly shopping trip that much easier. Serve the fish with a squeeze of lemon for a great, healthy protein that the whole family will love. You can substitute other white fish fillets for the flounder, such as tilapia or sole. To make this recipe gluten-free, swap the all-purpose flour for your favorite gluten-free flour mix. 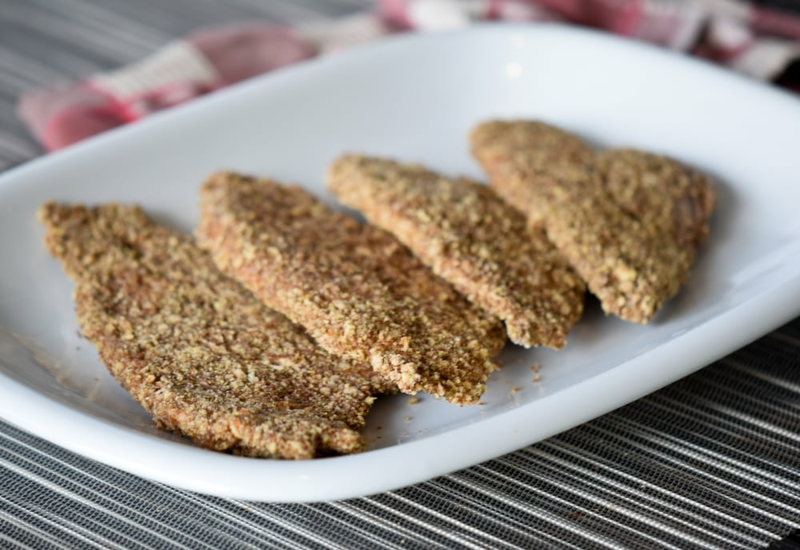 You can also try the pecan and flax coating on chicken strips! Per Serving: 460 calories; 31g fat; 19.6g carbohydrates; 29g protein; 164mg cholesterol; 765mg sodium. Would never have thought to do this with pecans. Let my five-year-old help with the breading process, which made for a messy but fun prep time. Pecans really brought a lot of flavor. May try with chicken, too. We couldn't find flounder so we opted for cod instead. We wanted to try out this style of breaded fish as we usually are suckers for deep fried fish. This was okay. It's going to take some getting used to with the flaxseeds. My wife was more of fan than I was. If I find flounder, maybe we will give this a go again. I used gluten free flour for this recipe, I thought it was really good! I also swapped pecans for almonds and it worked well. I've made this recipe twice. Once with tilapia and a second time using the pecan and flax coating on chicken strips, as suggested in the tip box. I thought both recipes were good. I like that I have an option other than frying my food, and I don't have one of those fancy air fryers. I'd make this again for sure. Made this with flounder and gf flour. Thought it was pretty good. The pecan crumb mixture was really good, I want to try it again with chicken tenderloins.